Electrical Contractors License is required to Advertise Solar Panel Installations on the internet (Google, Bing etc.) or over the phone. The state requires TECL #29509 to be Texas Department of Licensingdisplayed on all forms of advertisement. Online Marketing Companies, Retail Electric Providers and Solar Leasing Companies are not licensed to advertise in the state Texas. Buyers of renewable energy projects should look for the State Certified License number on web sites, banners, business cards and contracts. Consumer Alert: Online marketing companies (mostly form Arizona and California) promising to represent Licensed Electric Contractors are in violation of “Texas State Law” and are subject to $2,000 fines. General Contractors, (Roofing, Insulation, Energy Audit, Air Conditioning Companies, etc. ), Solar Installer Directories and all forms of Online Marketing must display their (not someone else s) Electrical Contractors License on all Ad’s (TV, Internet, Business Cards, Brochures and CONTRACTS). Nonprofessional Product Channels(illegal installer referral networks, online marketing companies, shopping carts, dealer directories, yellow page directories, and manufacturer dealer listings) skirting regulation can often be the source of low quality solar panels (with no actual warranty or short life) and dangerous installations. Texas violators are subject subject to fines (even if they are located in other states). Texas Attorney General has been asked to investigate these companies for consumer fraud . General Contractors can not promote solar power installation, as they can avoid accountability, used unlicensed installers and provide little or no margin for installer warranty. Marketing companies are usually in the business of running up the adverting cost of local companies while selling your information to the highest bidder. Most of them are willing to sell your information to unlicensed, unqualified and inexperienced installers. Please check the Solar Power Installation licensing Click Here or file a compliant Click Here if you suspect a unlicensed companies soliciting electrical work. Beware of fake companies that mirror real companies with stolen photos, shopping carts or manufacturer websites that sell sub-standard products. Micro-websites that advertise and sell installations to non-licensed and under qualified installers. Be wary of illegal advertisement by national or regional marketing companies squeezing profit from equipment and installation. This leaves the customer with poor installations, product failure and no warranty. As required by the state of Texas to advertise wind turbine and solar panel installations. In 1999 it’s founder Charles Crumpley began a campaign that promoted the Texas renewable energy market. 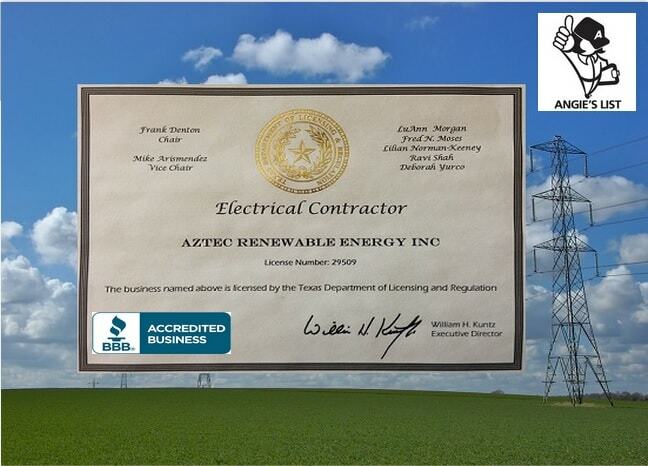 On September 1, 2004 “Texas State Law” required companies engaged in the advertisement and installation of Wind Turbines or Solar Photovoltaic (solar Panels) to display their ”Electrical Contractors License” (requires full time master electrician and insurance) on WEB SITES, brochures, estimates, contracts and invoices. On January 1, 2010 it changed to include business cards. Today’s solar market has manufacturers cutting corners and sacrificing quality. We have recently seen a rise in dealer and do-it-your-self installations failures as these manufacturers seek unknowing distribution channels. Our license forces us to seek quality control from our suppliers by inspecting and reviewing quality reports. As a result, we have zero solar panel warranty calls! Texas state law protects consumers with legal and binding renewable energy contracts written directly with Licensed Electrical Contractors. Consumers should know that electricians (Apprentice, Journeyman’s and Masters) are licensed to work for Electrical Contractors and must operate under the protection of the Electrical Contractors License. Texas Electrical Contractors with solar installation experience abiding by the National Electrical Code, and OSHA Safety Regulations can make this technology SAFE, perform as designed, last up to 40 years and support their warranties. General Contractors can sell green projects including wind or solar power, but can not market, sell or install wind and solar projects directly. Retail Stores and Shopping Carts can sell product but can not promote or advertise installations. We have discovered that most complaints about renewable energy comes from distribution sites (manufacturers, shopping carts, dealer directories & marketing sites) promoting unlicensed or start up installers. Contact the Texas department of licensing for details and clarification. Improper installation, license and insurance can result in poor performance, voided warranties, $2,000 fines and denied insurance claims. Why is this the law? Renewable Energy Companies operating without a license (must be displayed on web site) have no code of conduct (regulated by license) are willing to promote poor products for short term gains. They offer no no real warranty, can perform dangerous installations (600VDC connections) and then go out of business. In addition high voltage DC is much different than the AC power we grew up with. Improperly installed, 600 Volts DC can burn your house down or leap across the air and kill. More specifically, peak voltage greater than 42.4V is hazardous; voltage less than or equal to 42.4V, or SELV (safety extra-low voltage), is non-hazardous. It is difficult to know when electricity can cause serious injury or be fatal. Contact for only 1 to 3sec with currents of only 6 to 200mA can cause electrocution by disrupting the normal rhythm of heart muscles, resulting in fibrillation and leading to death. The law’s listed below are designed to protect consumers. .
maintain employee records and records of all work performed on its behalf for a period of four years after completion of the work, and shall make those records available to the department at the contractor’s place of business during normal business hours for inspection and copying. If the contractor’s principal place of business is located out of the state of Texas, the department may require the contractor to make records available to the department at its offices in Austin, Texas or another location agreed upon by the department and the contractor. The design of an electrical system shall only be done by a licensed master electrician or design professional as authorized by statute. The design shall not be subcontracted to an unlicensed person, firm or corporation. A licensed electrical contractor shall display its name and license number on both sides of each vehicle owned or operated by the business and used in the conduct of electrical work. Lettering shall be of a contrasting color and at least two inches in height. The license number shall be preceded by the letters “TECL”. signs located on the contractor’s permanent business location. The electrical contractor’s name, address, phone number, and license number shall appear on all proposals, invoices, and written contracts from the contractor. The following information: “Regulated by The Texas Department of Licensing and Regulation, P. O. Box 12157, Austin, Texas 78711, 1-800-803-9202, 512-463-6599; website: www.license.state.tx.us/complaints” shall be listed on all proposals, invoices, and written contracts. A licensed electrical contractor and its designated master electrician of record is responsible for supervision of all licensees performing work on behalf of the contractor to assure compliance with applicable statutes and rules and in particular, standards of conduct set out in this chapter. An electrical contractor shall not use a license that is not assigned to that contractor. ensure that all of an electrical sign contractor’s non-exempt electrical work shall be performed by licensed individuals. (c) The design of an electrical sign shall only be done by a licensed master electrician, master sign electrician, or design professional as authorized by statute. The design shall not be subcontracted to an unlicensed person, firm or corporation. (d) A licensed electrical sign contractor shall display its name and license number on both sides of each vehicle owned or operated by the business and used in the conduct of electrical work. Lettering shall be of a contrasting color and at least two inches in height. The license number shall be preceded by the letters “TSCL”. (f) The electrical sign contractor’s name, address, phone number, and license number shall appear on all proposals, invoices, and written contracts from the contractor. The following information: “Regulated by The Texas Department of Licensing and Regulation, P. O. Box 12157, Austin, Texas 78711, 1-800-803-9202, 512-463-6599; website: www.license.state.tx.us/complaints” shall be listed on all proposals, invoices, and written contracts. (g) A licensed electrical sign contractor and its designated master electrician or master sign electrician of record is responsible for supervision of all licensees performing work on behalf of the contractor to assure compliance with applicable statutes and rules and in particular, standards of conduct set out in this chapter. (h) An electrical sign contractor shall not use a license that is not assigned to that contractor. All persons must perform non-exempt electrical work, non-exempt electrical sign work, non-exempt journeyman lineman work, or non-exempt residential appliance installation work in compliance with applicable codes and ordinances. The department will interpret applicable codes and ordinances for purposes of enforcement of the Act. 1999 Renewable Energy Pioneer, Licensed Electrical Contractor, Nearly 400 Renewable Energy Installations, Real Inventory, Real Photos (not stock photos), Member of the Better Business Bureau, Member of the Home Builder Association, EPA National Speaker, Master Electrician on Staff as required by Texas State Law. Why Choose Aztec Renewable Energy? Renewable Energy is key to our low carbon future, reduces cancer cases, birth defects as well as diversifying our energy sources. READY TO GO GREEN? LET’S GET STARTED! Copyright©2016 Aztec Renewable Energy Inc | Designed by . Talk to a Solar Expert Today!